Hi! Can you inform me what is the most up-to-date parser for tmx files for c++? Should be no problem. Are you trying using the itch.io app or the website? This is perfect to create my turn based SRPG. Thank you. To see the download options without paying, all you need to do is click "No thanks, just take me to the downloads" on the pop-up that opens when clicking the Download button. Unfortunately, not explicitly asking for donations leads to much less people donating, which would mean I can spend much less time working on this tool. Looks interesting to use, just wondering, any compatability with Unity? Or would I have to save it as one big sprite and work from there? There is no native support for Unity, but there is a very nice Tiled2Unity solution for converting Tiled maps to Unity meshes and game object instances. There is also Tiled4Unity, a variation that avoids the need for using an intermediate application. Check out this page for other potential options. for what a game is this map editor? This map editor is not for any game in particular. It can be used for any game for which the content can be described with the primitives provided by Tiled. This includes most tile-based games obviously but levels can also be made of freely placed images. Examples of games that have used Tiled are Shovel Knight, Axiom Verge, Road To Ballhalla and Brigador. No problem at all. Tiled will always be available free of charge (and open source) because I think anybody should be able to use it regardless of their ability to support the development. I hope you will find it useful! This is doable in Tiled, either by placing the upper part of the tree in another tile layer or by using tiles that are higher than the height of the grid, in which case the tile image will extend to cover tiles above. Great app but for some reason it won't install using the itch desktop application for OSX. I can download it from the web version no problem but not from the desktop app, just an FYI. Thanks for mentioning it, I'll be sure to look into the problem! I anyway am planning to change the OS X package from a .dmg to a plain zipped up .app folder, which seems to be more common nowadays. Maybe that will resolve this as well. I'm also unable to install on macOS X. On the game page I was able to get the .dmg and install it manually. Hello Roadhammer Gaming! First of all thanks for buying Tiled! Unfortunately you're running into a regression in the latest release that I'll try to fix in a 1.0.2 release soon. Thanks to your detailed report it occurred to me that I forgot to list external tilesets that have not been added to the map yet in the Terrains view. As a workaround, you can place a tile from the tileset manually first or choose Map -> Add External Tileset from the menu to add your tileset to the map. ahh ok cool thanks alot I will do that, great work with this program and I'll be looking out for the next update, happy gaming! Compile Qt for Google Native Client and then compile Tiled against that version of Qt, in order to eventually have something that you may be able to distribute to Chrome browsers. Not an easy project and making Tiled usable in that environment will likely require additional changes. Install a Linux desktop alongside Chrome OS, so you can install Tiled there. Note this should not be read as a recommendation to do it. Use a remote desktop application to access Tiled installed on another computer. Please assist, how can I import a json level into tiled? Tiled is a truly wonderful program. It is also how I discovered the itch service. Bravo! I appreciate your effort on doing this software. My team used it two years ago for a University game project, Element Supremacy. Me and the other programmer just thought to the game logic while the three designers were free to use Tiled to create the maps with the arts created by themselves. Thank you for your work, Sorry I was not able to donate more than $1 at this time, the small donation in no way reflects how I view your time and efforts. Thank you for your hard work you put into this. I hope it helps me move ahead with my project(s). Hey Hordecall, first of all thanks for your donation! About your problem, I assume you've already tried changing the base color of the theme? This also affects the tile palette background somewhat (if you're on macOS, change to "Tiled Fusion" theme first). Another option is to try a development build where I've coded a background color option per-tileset, though unfortunately it's a little unstable at the moment. You can find the latest build for Windows here. I used Tiled to design the levels in Depth of Extinction! Really love your product for making levels in Unity (and the Tiled2Unity plugin of course). What's the benefit if I already have tiled2unity set up? I actually use tiled2unity Lite as I am on a Mac and just prefer it since it removes the intermediate application as well. Right now there would not be any big difference, what I did was to move all the importing process into Unity instead of having an external tool like tiled2unity or tiled2unity Lite, so Unity Editor takes the TMX file an does all the process that tiled2unity used to do externaly. There is still an XML file generated by tiled2unity, that's my next objective to remove that file then you would always have only your tmx file in the unity project. In my opinion the usage of TMX file inside Unity would be more clear an transparent since the workflow would be very similar to importing a FBX file for a 3d model. Awesome update! For those of you wanting is see some of these features in action, checkout 1-800-Monsters. You can even explore the resources in here and actually edit these maps. I am slightly confused on how software like this works. Is this compatible with all game making programs, or is it just a plugin to some other program? Tiled is a standalone program. It is used to create map files that can then be used in your game engine to load up maps. I wouldn't necessarily say that it is compatible with "all" game making programs but a lot of engines have Tiled support out of the box. Programmers can write a Tiled Loader in their favorite programming language. Thank you. Actually a couple of minutes ago I figured out that my game maker engine has a tiled based system that I have no idea how to use. I might use this program now :D.
Thanks for the wonderful software! Hi!I bought Tiled map editor. &I wont get this tile map.where can i buy? You cannot buy these maps, but you can find free assets and create them yourself. Thanks for the wonderful software! It fits well for my game, Legacy Bits, which is being developed using HaxeFlixel. Gonna send money if the game goes well one day. Also found something which seems a glitch. When I put an object with image (Insert Tile) in Objects Layer, the Y value was increased by that tile height (in my case, the Y was 16, which supposed to 0). The X is correct. Had to do object.y += 16 to get correctly placed in the game. That is not a glitch but an unfortunate inconsistency in where the objects are anchored. Whereas rectangle objects have their origin in the top-left, the tile objects have their origin in the bottom-left (or even bottom-center, in the case of isometric maps). At some point in the future I'd like to unify all this. Will there be an option to change the anchor in the future? Probably. There's a related issue on GitHub about having the anchor in the center. I'm just not sure exactly where to put this option yet. After giving this software a good try, I will probably send money if I like it. For now, I've only read good things about it and must assume it's handy! You're welcome to! Of course Tiled won't fit everybody's project, but feedback is always appreciated and I'm continuously working to improve it. Can I build a time machine from tiled? That's something you'll need to implement in your game / engine. You can use Tiled to set custom properties, for example to configure where the time machine will take you. is it compatible with gamemaker studio ? It doesn't directly save/load GameMaker files, but there are some conversion tools available for converting Tiled maps to GameMaker rooms. There is a discussion about adding support for GameMaker on the Tiled forums. I'm not sure if this is just me, but I am getting a bug when I maximize the program (Win10). Tried unistalling and reinstalling, and changing 32 and 64 bit, but no fix. Making it difficult to switch which screen I have it on. Do enjoy the software though! 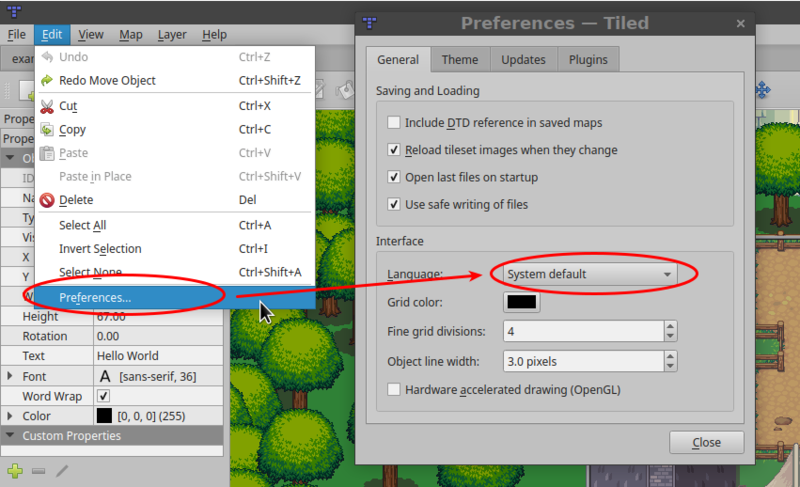 This is a known issue that will be gone once Qt 5.6.1 is released and Tiled is compiled against that version. In the meantime, it usually helps to close the Maps view while doing the resize, since the crash is related to the rendering of the file icons. It's fixed now. It was due to a bug in itch.io, that I have reported now.